​​​​​ ​DALLAS – Alston & Bird LLP will relocate its office from 2828 Harwood in Uptown to two floors in the Chase Tower on Ross Ave. The Atlanta-based legal firm is renting 36,081 sf in the building, which is undergoing millions of dollars in upgrades. The firm’s move downtown comes at a time when many high-profile legal firms are exiting the old financial district for newer buildings in Uptown. 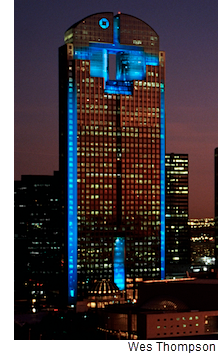 The legal firm's new digs in Chase Tower represent growth for the Dallas operation. Chase Tower is owned by New York-based Fortis Property Group, which last year paid $285 million for the skyscraper. Chase Tower's previous owner, Houston-based Hines, spent more than $10 million in upgrades on the high-rise; Fortis is continuing redevelopment on the exterior of the 30-year-old building. ​See ​also: DFW Office Market Research.